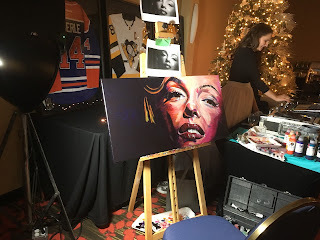 I was working away at my live painting of Marilyn Monroe at last night's Talitha's Hope 4 a Cure event at the Quality Hotel and Conference Centre when self doubt and panic started to creep in. There have been several live painting experiences that I've done when a combination of things start happening that make me question my ability to deliver a good product. Last night, I felt like I was fighting with the canvas. The paint was going on too dry and didn't seem to be covering the way that it normally does. I was also questioning the composition and the colour balance. Trust the process, I thought to myself. Trust the process. I kept plugging away as well meaning patrons streamed by saying things like "Beautiful" and "Wow!" I didn't believe them; I thought they were just trying to be kind. At some point, I got up out of my chair and walked away, to the far end of the room. My body gets a little stiff sitting in one position all night long. I looked back at the portrait of Marilyn from across the room and two words came from my lips: "Beautiful" and "Wow!" I was way too close to the forest to see the trees. Later in the evening, as I was packing some of my gear into the car, my friend Solange came running outside to say goodbye. She thought I was leaving and she had some things she wanted to share with me. "I'm not leaving yet," I said. "I'm coming back in." I followed Solange back into the hall, which was slowly thinning out after an exquisite evening of raising money for Talitha and other children who live with pulmonary hypertension. She shared her appreciation for being able to watch the process throughout the evening and seeing how the character of Marilyn came to life. "How do you do it?" she asked. "How do you choose the colours that somehow bring out the person?" I told Solange that I have absolutely no idea. In this case, I was really worried that I had missed the mark, until I moved away to get a different perspective. In all of my paintings, I go on a journey that is not pre-planned or intellectualized. I allow the subject, the colours, the brushes, the air and light quality in the space, the music, and the moment to take me where I'm meant to go. I'm so grateful that Solange took the time to gift me with her thoughts. I'm also grateful to Missy for spinning some amazing tunes. I was situated right in front of the speakers, adjacent to where she was deejaying. It was amazing. I told her - more than once - that if I was a millionaire, I would hire her to play music for me in my studio. It was a great mix and I'm convinced it influenced the work. 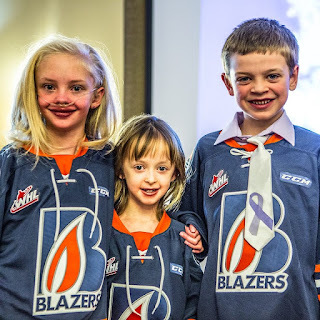 I'm in awe of the men and women who pour their hearts into Talitha's Hope 4 a Cure. They have raised over $600,000 over the years. It is an honour to be a small part of it. 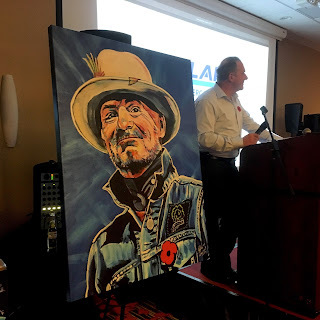 Don Moores (emcee and Grandpa to Talitha) and Ross Jacobs (auctioneer) put on a great show last night, generating lots of laughs and dollars. 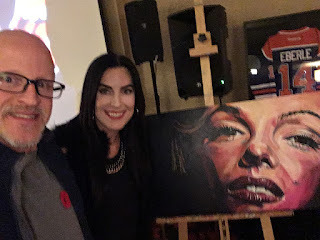 A 36" x 48" canvas print of my latest Gord Downie portrait raised $3,500 last night. 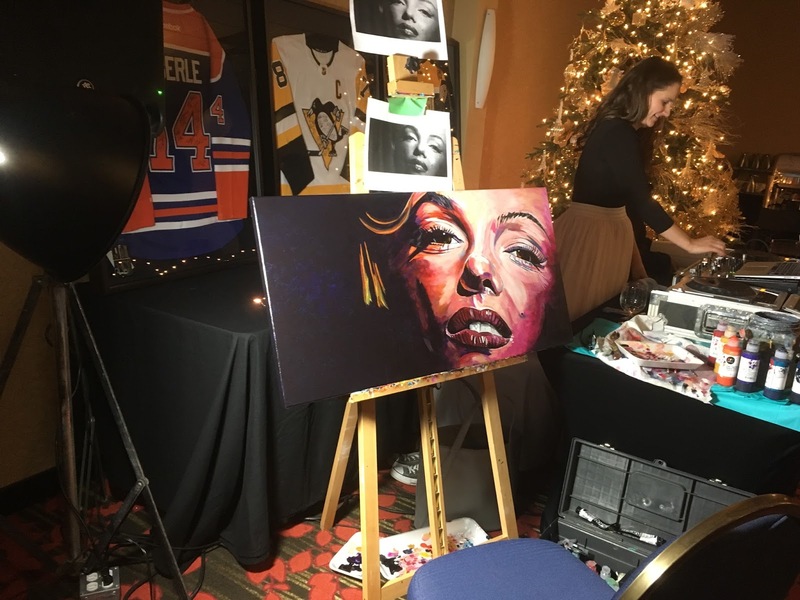 And I was so pleased that the portrait of Marilyn went to Amy, who contributed $1,050 to the cause. Amy recently picked up the original portrait of Slash. She can now say she has a collection. My thanks to Ashley for inviting me to participate again this year. I learned a valuable lesson about the dangers of standing too close to the forest. In the future, I need to take the time to walk away and look back from a different vantage point.